The Oregon Ducks continued to impress track and field fans with an impressive showing Saturday at the Rod McCravy Invitational Meet in Lexington, Kentucky. Edward Cheserek established his dominance in the distance events by comfortably winning the 3000-meter run with a 2015 world-leading time of 7:46.56. That mark also set new meet and facility records. Duck John Gregorek placed second and Jake Leingang placed fifth. 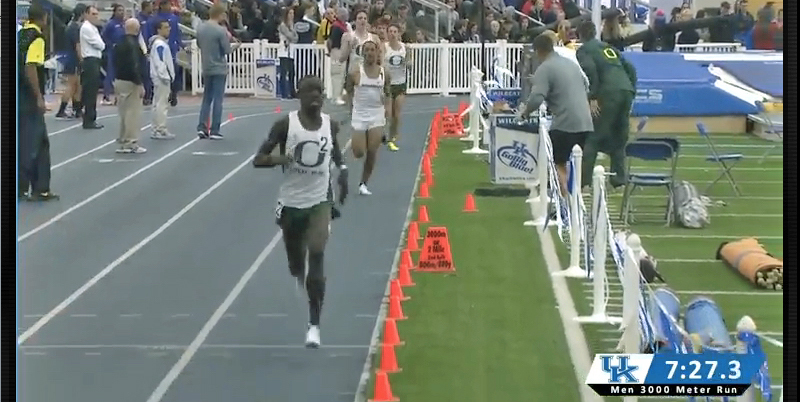 On Saturday, Cheserek helped the Ducks win the men’s Distance Medley Relay. On the women’s side, Sasha Wallace won the 60 meter hurdles with a time of 8.16, good enough for the second-best time in the NCAA this year. In the 60-meter dash, Jasmine Todd took second place and Jennifer Prandini nabbed third. All three runners will be in the NCAA championship discussion for the women’s sprints this spring. In the Bill Lee Men’s Mile, Colby Alexander took first and Daniel Winn finished second. With times a shade over the four-minute mark, both athletes established personal bests in the race and their times rank second and third in the NCAA this year. Next up for the Ducks will be the University of Washington Invitational this coming weekend. The first chance for local fans to catch the Ducks in action will be the Pepsi Team Invitational on Saturday, April 11, 2015.